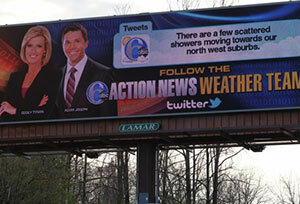 WPVI’s Action News is taking its message to the streets. And highways. And turnpikes. Literally, as they say, turning roads around the Philadelphia area (DMA 4) into an information superhighway. “We’re just trying to put our content in front of consumers wherever they are, whenever they need it,” says Mike Monsell, creative services director of the ABC O&O. It’s all part of a new digital billboard campaign first launched in February 2012 and continued in the first quarter of 2013. 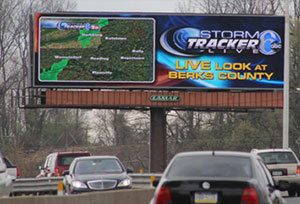 At its height, the 2013 campaign featured 10-14 billboards per day covering three-quarters of the Philadelphia market. Monsell says the digital billboards were mainly in the Philadelphia metro but also included boards in a half dozen of the surrounding counties extending down to southern New Jersey. The digital boards capture live tweets from the Action News team as well as live radar images. The radar images, which are stills, can be targeted to specific counties and can be updated every 3-4 minutes, according to Monsell. 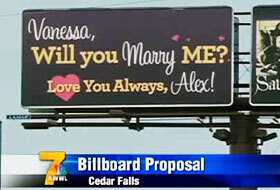 Monsell says the digital billboard content can be adjusted according to consumer needs. For example, on bad weather days, there will be more radar images than tweets. 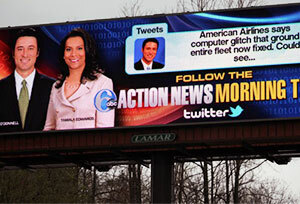 Monsell says the “tweets are live, and they refresh as fast as the billboards can update them.” In other words, the tweet that drivers see at the beginning of the 64-second ad cycle can be updated to a new tweet by the time the WPVI ad comes back again. Monsell says that expanding the station’s footprint to a new technology that adds more viewing screens across the area was a major factor in the decision to use digital billboards. This February, according to Monsell, WPVI’s Action News had the No. 1 newscasts in adults 25-54 at noon, 4, 5, 6 and 11 p.m., winning 98% of local news time periods in household ratings. The original article appeared on TVNewsCheck.com. The FBI teamed up in 2008 with Lamar Advertising and other digital billboard owners to display images and information about suspects and “most wanted” individuals. A year after launching the project, the FBI said it has been a successful way to find people.